The flagship floorstander in the Diamond 11 Series, the 11.5 exemplifies the stunning aesthetic, accessbility and high-calibre performance of the newest Diamond generation. 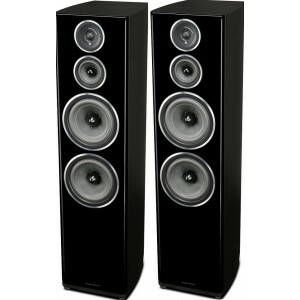 Wharfedale Diamond 11.5 Speakers (Pair) is the flagship floor-standing model in the new and upgraded Diamond 11 Series. The largest and most powerful model in the series, the 11.5 is also visually stunning thanks to its exquisitely curved cabinet design. Sitting atop of the 11.3 and 11.4 models, the 11.5 exemplifies the Diamond 11 Series' blend of accessibility and high-calibre performance. The new Diamond generation features upgrades such as updated in-house designed drive units, a high-performance textile dome tweeter, a redesigned crossover network and an improved slot-loaded distributed port. These additions truly take the Diamond 11 Series to next level of sound performance. Wharfedale has long endorsed the cabinet of a speaker as more than simply a piece of furniture, instead realising that attention to cabinet can mark out a speaker as extraordinary. Pioneering cabinet construction has long been part of Wharfdale's design ethos since the early days of founder Gilbert Briggs experimenting with materials. The new Diamond 11 Series continues this tradition thanks to its layered sandwich of woods of different densities. This feature minimises the features of the cabinet 'sound' which improves the overall musical performance. The cabinet walls are braced, which combined with the curved shape, lessens resonances more than 25dB below the driver outputs. The cabinet walls are also lined with a special internal fibre due to its brilliant absorption qualities across a wide bandwidth. Consequently, you can enjoy a sound performance unblemished by unwanted panel vibration and resonances. Wharfedale started with the belief that Diamond drivers should be aimed at performance. As a result. the Diamond 11 Series showcases advanced driver systems incorporating elements that normally only find their way into high-end loudspeakers. The bass and midrange drivers utilise a basket with a network of ribs that keep the rigidity of the basket while leaving spacious area behind the cone. The rigidity improves transient impact while the open area reduces early reflections to the cone and enables the special internal cabinet absorbent to do its work. 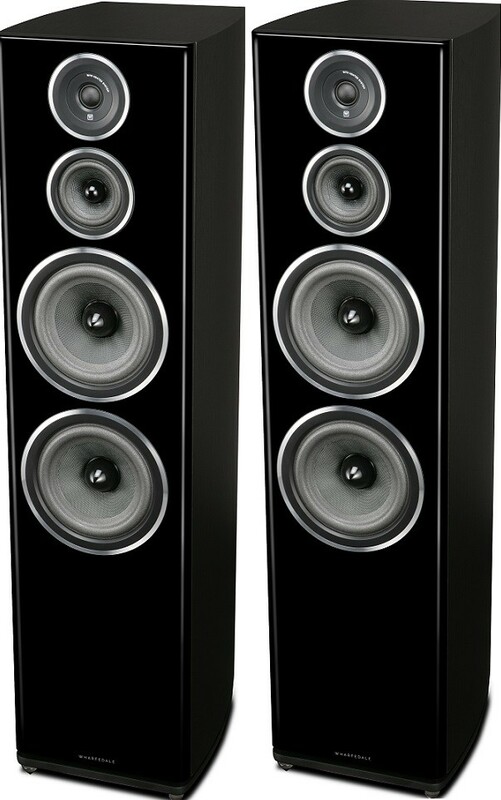 The Diamond 11 Series speakers also offer magnet designs to both raise sensitivity and ensure absolute control of cone movement over lower bass frequencies. The utilisation of a specially shaped single-forged pole piece with copper cap controls the magnetic flux and ensures low distortion through the critical midrange area. The progressive suspension is a lightweight foamed surround for a lengthy midrange response, in conjunction with a super-long-throw voice coil motor system, to achieve unparalleled linearity and accuracy. The woven Kevlar cone, a reliable feature of Diamond designs, has been treated to offer a precise match to the new suspension elements. A newly evolved tweeter design enhances the performance of the high-frequency. Once more, a large ceramic magnet system is used, with a copper cap for flux control. The pole piece is then vented through to a specially shaped rear chamber. A low resonant frequency is then created, ensuring brilliant linearity throughout the operating system and allowing the textile dome to contribute to a sharp midrange performance in addition to precise high- frequency detailing. First introduced in the Diamond 100 Series in 2012, the slot-loaded distributed port is another Diamond innovation. The internal port tube opens into a slot formed between the cabinet and the plinth. This mimimses the turbulence and unpleasant ‘chuffing’ suffered by conventional ported systems. Another benefit is to increase the efficiency of energy transfer from the bass reflex tuning to the room. Wharfedale has pushed this one stage further for the Diamond 11 Series, enhancing both ends of the port with a semi-parabolic entry and exit curve that linearises airflow through the port tube. This enhancement results in an increase in the volume of air n the slot-loaded system and further improves the low-frequency output performance. As a result, you can immerse yourself in a natural sounding bass performance with low-distortion. What's more, the low layout of the ported system enables you to position the Diamond 11 speaker close to a back wall, giving you more room planning options.